Once again Bill Eaton has been delving into the archive of material given to him by the late Frank Smith of Ravenscroft, and this time we are taking a look at the Big Lock and the Anglo-Swiss Condensed Milk Factory, both situated on the banks of the Trent & Mersey Canal and built during the late 19th century. The picture above shows the lock itself which, by its very nature, does not change very much over the years, except in small details. 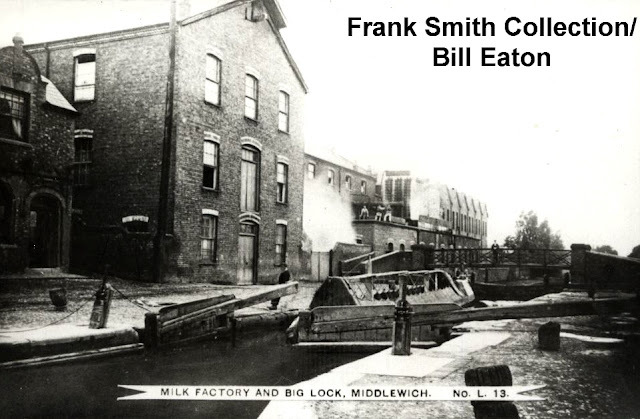 For example, notice the lock gates nearest the camera, which are of a type not seen nowadays (in this area, at least). They appear to be of all wood construction, rather than the mixture of wood and steel used nowadays. Behind the boat can be seen the footbridge which still links Webbs Lane with King Street via the public footpath which runs up the bank from the canal, alongside Harbutt's Field to join the main road at the foot of the bridge which takes King Street over the railway line. On the extreme left of the picture is the Big Lock Pub, greatly changed, but not beyond all recognition in the present day. Its distinctive doorway and part of the Dutch style roof are still very much in evidence. We have seen the other picture before, when we looked at the Condensed Milk Factory. Frank has obviously grouped these photos together because they were taken at around the same time. 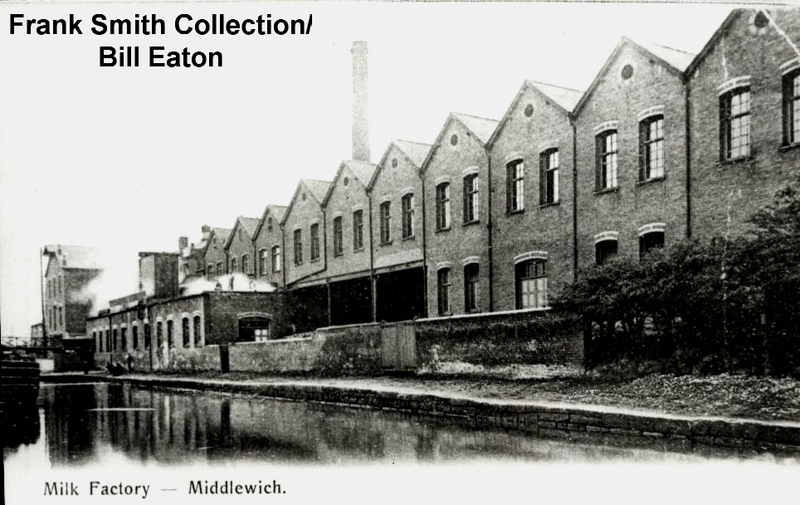 We've dated them as being taken in the 1920s, because, according to Allan Earl, the milk factory closed in 1931 after fifty-nine years of operation before being re-opened as a silk works in 1932. That perennial problem of the salt districts, subsidence, meant that part of the factory had had to be demolished a couple of years earlier, causing lost production and financial difficulties, both for the milk company and the many local farmers who supplied it. Both these pictures give an impression of the factory working at full swing, so were probably taken a few years before these problems emerged. The tall building which dominates the left hand side of the top picture is the same one which can be seen on the extreme left of the lower one.